Kneel on floor knees together feet just wider than hip distance lean forward and place head on floor. Take your fingers behind your knees and with your fingers move your calf muscle down your leg towards your ankle and out towards your outer leg as you sit back between your feet. 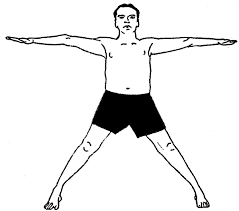 Press all ten toes, the top of the feet, and the shins into the floor as you extend your torso towards the ceiling. Lengthen your thighs towards your knees and move your tailbone into the body. Open the chest and move the shoulders away from the ears. Look forward and keep the back of the head in line with the sacrum. 1. 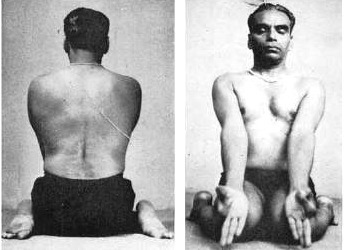 Interlace the fingers in Baddhanguliasana and bring the arms up over the head pressing the finger mounds towards the ceiling and bringing the thumb and pinkies towards the ground. 2. Maintain weight in the sit bones and the tailbone in the body as you extend from the inner arm through the arms to the wrist and rotate the outer arm in. 3. Keep the shoulders away from the ear and lift the sternum. Release and change the interlock. 1. Take the left hand to the right thigh and the right hand behind the right hip, press into the shins and sit bones, lift the torso and turn. 1. For an easier pose, take the knees apart and bring the toes together. For a more advanced pose keep the feet where they are and just bring the knees apart. ward keeping the hips on the heels and walk the hands forward till the head rests on the ground or a brick keeping the hips on the heels. 3. Press into the hands so weight stays in the heels and rotate the inner arms out.